CPI Beverly offers the VPX3469 magnetron transmitter system for use as a high-power source of RF power for outdoor-mounted radar applications. The transmitter cabinet contains the high voltage power supply, solid-state switch, and the high voltage tank assembly which includes the pulse transformer, energy storage high voltage capacitor, and filament power supply. The VPX3469 air-cooled transmitter features 300 kW peak power RF, built in diagnostics and BIT for local or remote troubleshooting, and a compact design for remote operation. 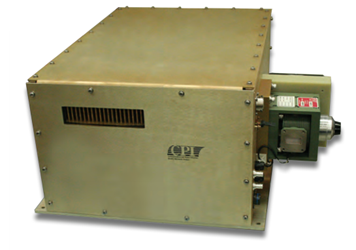 The high voltage power supply (HVPS) is inside the enclosure and is completely self-protected with over current and input under/over voltage circuits. The high voltage power supply converts input AC into DC then switches it utilizing a short-circuit proof series resonant inverter. For additional information on the VPX3469, download the datasheet.